WWE's Twitter handle has posted a video featuring a dejected New Day, wondering whether they should quit the company. After Kofi Kingston lost the gauntlet match on tonight's SmackDown, the future is looking bleak for the WWE Superstar. Kofi Kingston competed in a gauntlet match on tonight's show. He went all the way, pinning the likes of The Bar, Samoa Joe, Eric Rowan, and Randy Orton. As The New Day was celebrating Kofi's hard-fought victory amidst a sea of cheering fans, out came Vince McMahon. He announced that Kofi needed to face one more Superstar in order to get his shot. Daniel Bryan's music hit and out came The Planet's Champion. Kofi failed to put Bryan down, and lost his chance to face Daniel Bryan at WrestleMania 35. As a battered and dejected Kofi Kingston sat with his head down, his New Day counterparts proposed an idea to him. The livid duo of Woods and Big E suggested that they should leave the company. Big E went on to explain that Kofi had done all he could do, but to no avail. The clip ended with the trio leaving the area to discuss the idea and its implications on their future. Kofi Kingston's struggle to grab the brass ring has ended in defeat again. Vince McMahon has been screwing him for the past several weeks and it seems like Kofi is about to reach his boiling point. Kofi's storyline will continue on next week's SmackDown Live. 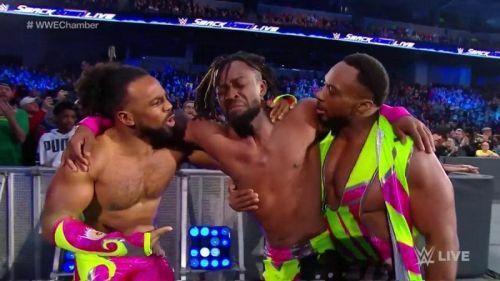 Maybe that's where he'll get back his shot, but as of now, things are not looking too well for Kofi Kingston as he heads towards WrestleMania 35. Will Kofi Kingston get his shot back next week? Or is it time for the trio to leave the company and go for greener pastures? Sound off!